Recent research results undertaken by the University of Wisconsin Discovery Farms has documented that runoff occurs from feed storage areas during 60 percent of precipitation events. This compares to 9 percent for farm field runoff losses. Discovery Farms has been documenting runoff from storage areas on three private farms during the past three years and summarized some of the findings in their recent newsletter. 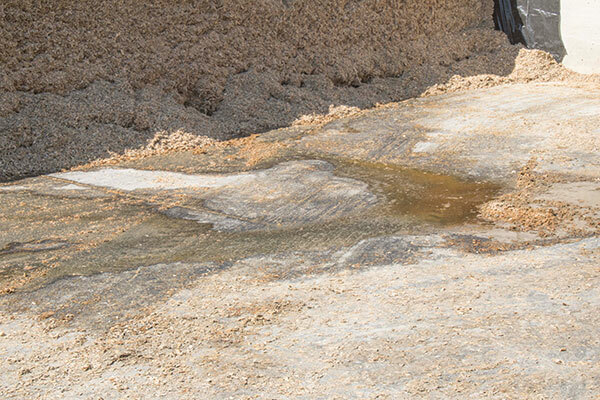 The researchers make a point to differentiate runoff from leachate, the latter being liquids lost from the silage pile in the absence of precipitation. These occur following the ensiling and packing of a high-moisture crop. Conversely, runoff is the result of precipitation or snowmelt that comes in direct contact with the silage and is often the more common cause for nutrient loss. Because feed storage areas are impervious, liquids are more likely to runoff compared to fields where there is often infiltration into the soil profile. One acre of feed storage area can lose as much nitrogen and phosphorus as 200 cropland acres. 1. Harvesting forage at recommended moisture levels. This decreases leachate seepage, feed spoilage and loss of nutrients. 2. Cover both the silage pile and bunker retaining walls. This reduces precipitation contact with the silage. 3. Remove or cover spoil piles. Discovery Farms has documented that some runoff from feed areas is extremely high in nutrient concentration, and some is not. They currently are identifying ways to capture liquid only when it contains high levels of nutrients and organic acids without capturing unnecessary amounts of low-risk water. You can read more about the project at UW Discovery Farms’ Feed Storage Leachate Project page.